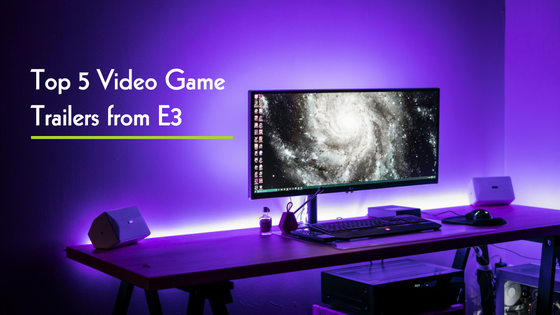 Every year, video game enthusiasts look forward to E3, or the Electronic Entertainment Expo – an exciting event where different developers and gaming studios come together to unveil upcoming video game releases. At this highly anticipated event, the top companies release trailers showcasing groundbreaking technologies and never-before-seen products. But with so many games announced for the coming year, it’s difficult to know where to focus your attention. The team at Gametruck San Jose is here to help – we’ve picked out the top five video game trailers from E3 that you can’t miss! Halo Infinite resumes the story of Master Chief where it left off in Halo: Guardians, and from the trailer, we can see that this game promises to continue the epic legacy of the series. With the brand new Slipspace engine serving as the game’s base, the trailer beautifully brings back the sprawling landscapes and action-packed environments that players associate with the Halo series. To top this off – the ending of the trailer shows a twist that is already sending fans into a frenzy. As the Master Chief loads up a new A.I. into his helmet, we can’t help but wonder – who will take Cortana’s place? The Fallout series is releasing its long-awaited prequel, Fallout 76’, in early November of this upcoming year. The trailer shows that this latest addition plans to improve and innovate on previous games in various ways. The game takes place 25 years after the nuclear war that devastated Earth, making it the earliest in the entire series. Unlike other Fallout games, 76’ will be an online multiplayer game which can be played individually or with up to 3 other players. Fallout ‘76 will also feature no human NPC’s, as all in-game people will be other players. A favorite since the days of the Nintendo Gamecube, Super Smash Bros Ultimate for the Nintendo Switch only raises the stakes higher and makes some new changes to the party fighting series that many will find refreshing and exciting. The game boasts the most extensive character roster so far, with 66 characters announced and likely a few secrets ones too. Players will now choose the stage before selecting a character, and the losing player of a match selects the following one. So far little has been released about new stages, but old favorites will be returning with much more detail than before. Certain character traits will be visible now to other players, such as knockout counts, and players with consumable powerups will have a gauge to show how long they have left to use it. A new and entirely different game from their previous work, Cyberpunk 2077 takes place in a dystopian sci-fi future. The game will be an open-world environment with six distinct areas in an expansive city with all kinds of characters to interact with and explore. Players will be able to control all facets of dress, physical looks, and now also the cybernetic enhancements of their character. These options will affect how NPC’s interact with the player and determine which paths and quests bestowed to the player. 13 years might as well be decades in gaming years, considering the second installment of Kingdom Hearts was released in the PlayStation Two era of 2005! Kingdom Hearts 3 is the long-awaited sequel in the Kingdom Hearts series, and it’s going to be bigger than ever. The latest game features Disney’s newest franchises, and you’ll be able to find worlds and characters from the Marvel Universe and new Disney favorites like Frozen, Tangled, Toy Story, and Monsters Inc! With so much time between the games’ releases, Kingdom Hearts 3 gives a whole new generation of gamers the opportunity to experience the magic and wonder of interacting and exploring various Disney worlds and characters like never before. So far it has been an exciting year for gaming and Gametruck as well! With an expansive library for multiple consoles, you can have your next video game party with plenty of titles to play. Let Gametruck San Jose come to you and make your next event the most memorable yet! Visit our website or call us at (866) 253-3191 to plan your next party or event!